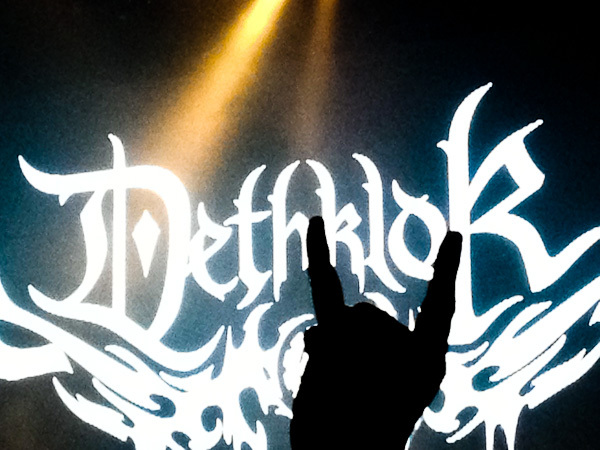 The hubby and I went to see Dethklok play this past Tuesday at The Palladium in Los Angeles. We tend to go to Los Angeles quite a bit these days, whether it be for concerts or tattoo sessions, and whenever we do, we ALWAYS seek out a new restaurant to try. That’s the beauty of Los Angeles – there seems to be an infinite supply of restaurants, pubs, gastropubs, eateries, etc. Some of them are nothing to write home about. Then there is that one gem that makes you feel so spoiled and giddy. The experience at Mohawk Bend can be likened to a spa trip for foodies. The ambience was stunning! It was swanky and comforting at the same time. 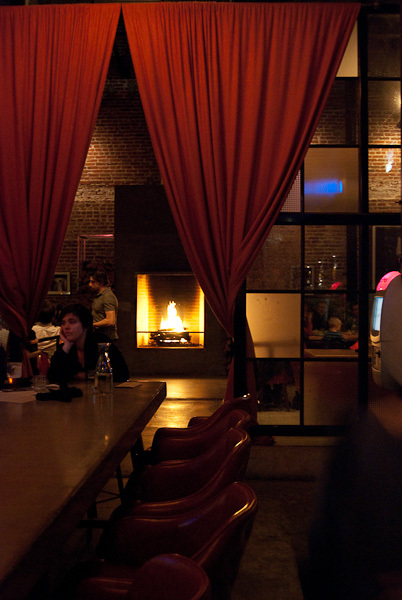 There’s a lounge in the front prior to entering, that has cozy chairs and couches with perfectly placed fire pits. A huge glass door with iron trim opens to a beautiful space with high ceilings. 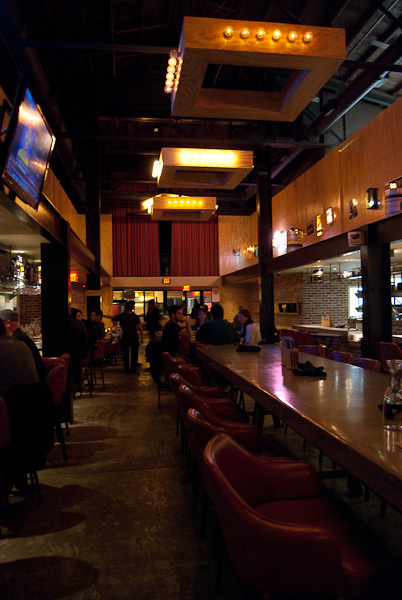 An open kitchen spans to the left, what seems to be a never-ending bar sprawls down the right, and in the middle is a huge concrete counter-top lined with seating that fosters a community-style environment. 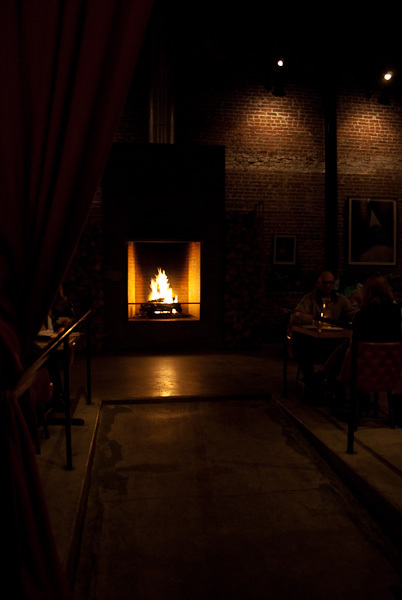 That long table top draws your eye to the back of the building, where red, velvety fabric drapes from the ceiling in dramatic fashion, revealing another dining area complete with a large cozy fireplace. 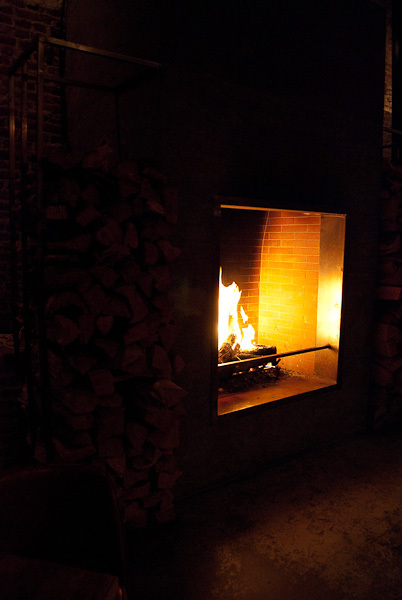 I’m absolutely convinced that EVERY restaurant should have a fireplace! It felt like coming home. If I ever felt the need to open a restaurant, it would be Mohawk Bend. They care about where their food, wine, and beer come from. It’s the ultimate Californian paradise! 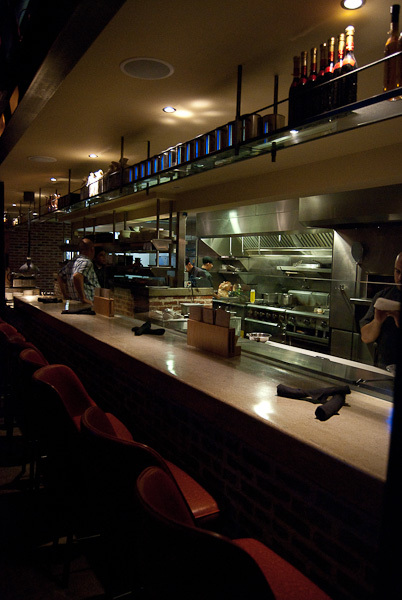 All food is sourced from local farms. All the beer and wine is from California. 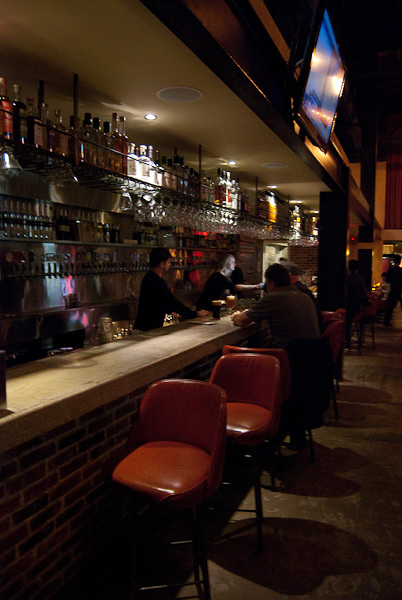 All of their bar syrups, juices, and garnishes are made from scratch. They serve healthy vegan food along with items to please the pickiest carnivore. They have created THE perfect restaurant. Sometimes when I go to restaurants like this, like Palm Greens in Palm Springs, I play it safe when I pick something off the menu. I go with something I’m familiar with, which is kind of out of character for me. I LOVE to explore food! This time I vowed that I would try something completely different, and definitely order all vegan. Carolyn Scott-Hamilton from the Healthy Voyager turned me on to this place, and said that the Cauliflower “Buffalo Wings” ($7) were out of this world! We started with that and two kind beers! 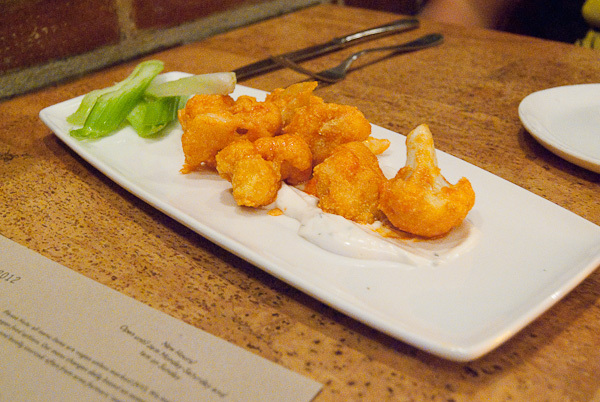 All day today (the day after), all I could think of was the buffalo style cauliflower. I could eat it for breakfast lunch and dinner, and I definitely need to figure out how to make the vegan blue cheese dressing! You’d seriously never know it was vegan. 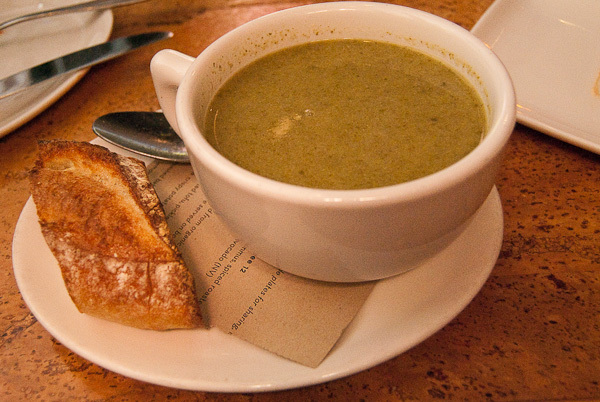 I wanted to try as many things as possible, so I opted for the soup of the day, which was broccoli ($6). It was thinner and less creamy than I was expecting, but it was still really good, and the bread?! The bread was crunchy on the outside, and beautifully chewy on the inside. Perfect dipper! 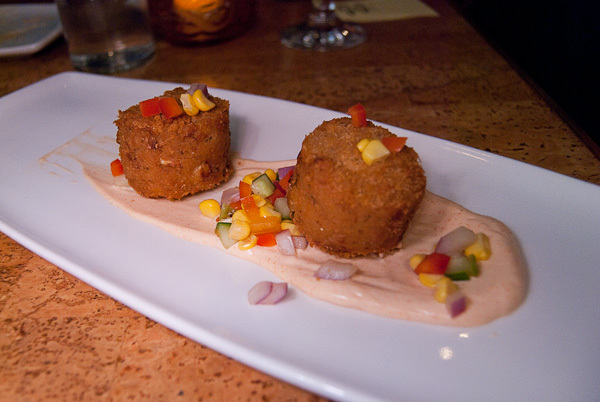 Crab cakes are something that I always order at restaurants, but they’re always loaded with crab meat. I was curious how they would pull this off with the hearts of palm. They were more dense than a normal crab cake, though it was definitely not bad thing, and the flavor was spot on! The vegan smoked paprika aioli was perfectly creamy and spicy, and the nice fresh crunch of the corn relish was phenomenal. At $11, it seems a bit pricy, but as I said, the crab cakes are dense, so by the end of the meal I was stuffed! That could have something to do with having a slice of my husband’s pizza. Teehee! 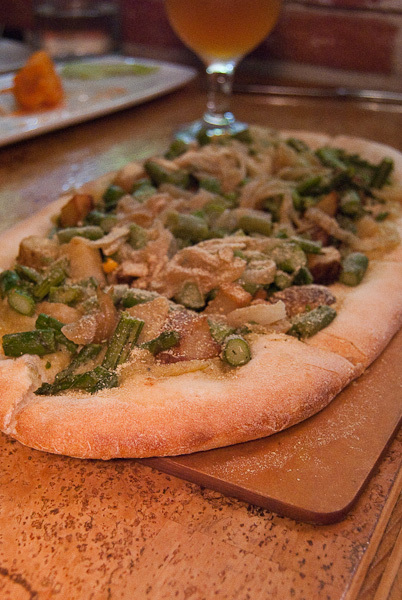 Here we have the Asparagus & Potato Pizza($12) with caramelized onion, roasted garlic & leek puree, and nutritional yeast. Personally it could have been seasoned a bit better, but it wasn’t anything that a little salt sprinkle couldn’t fix! The potatoes were perfectly cooked, crispy on the outside, and creamy on the inside, and there were piles and piles of asparagus! Ok, that covers the food, but I mentioned kind beer earlier. They did not disappoint with the selection from Stone Brewing Co., Golden Road, Bear Republic, Knee Deep, and others. Hubby had Dry Creek by Bear Republic, and I had Burning Bush from Golden Road. Great great GREAT beers! 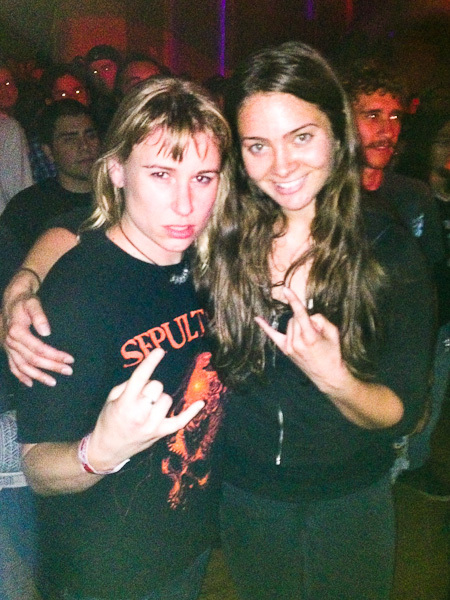 …and here I thought all this time that Los Angeles wasn’t hip to the craft beer scene. Boy was I wrong. If you are ever in the Los Angeles area, do yourself a favor and GO HERE! Mohawk Bend EASILY makes The Devil Wears Parsley Restaurant Of The Year 2012, and we didn’t have any of their hand-crafted cocktails, wines, or dessert! Everything about this place is so perfect. You will not regret it!! I’m really not that mean / angry!! It’s all a front, I swear!! Hand Crafted Cocktails & Spirits! Slap yo mama, it’s so good menu that’s VEGAN FRIENDLY! “Our menu changes with the seasons.” Are you kidding me?! NAILED IT! If you don’t like this place, I seriously owe you a beer on one condition: that I buy it from this place. Wow, you guys went on an adventure! I don’t think I’ve ever gone that way down sunset. Where do you find your restaurants up there? I’m not sure I would like their vegitarian meals, but the food sure looked great for what it was. I am so jealous!!! Of the food and entertainment, you lucky duck. I will add this restaurant to my list of places to try when I am in the LA area again. Thanks for sharing. OoOOOhhh food p0rn! I thought I would check out your site after your mention of craft beer on Twitter and the fact that we will both be at BTP. I’m so glad I did as I would love to check this place out while I am in LA. I might have to check in with you for additional restaurant recommendations as well. I’m adding this one to my list for sure. This place is #2Die4!!! Loved everything about MOHAWK BEND. I can not get back there fast enough!. @Brian Wilke, you should get more adventurous when it comes to food….you don’t know that you won’t like it until you try it sir!